Price: £1.90 (incl VAT) Sorry, this product is no longer available. 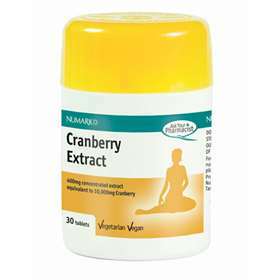 Numark Cranberry Extract - 400mg concentrated extract equivalent to 10000mg Cranberry. No artifical flavours or preservatives. Cranberry Fruit Extract, Dicalcium Phosphate, Msltodextrin, Cellulose, Cross-linked Sodium Carboxymethylcellulose, Hydroxypropylmethylcellulose, Silicon Dioxide, Colours (Titanium Dioxide, Iron Oxide), Magnesium Stearate, Stearic Acid, Talc. Product code: 3861952 Price: £1.90 (incl VAT) Sorry, this product is no longer available.